Sick and tired of rushing to the front door after hearing the doorbell but with no idea who it is? Could it be a close friend or just an unwanted sales person? Clearly a traditional doorbell is not going to help you. But a doorbell with an intercom will- and if it is wireless as well that is a big bonus. So, What are Wireless Intercoms? Let me tell you what they aren’t. Intercoms are more complex than a traditional doorbell (which has no microphones or speakers) but they are much simpler than a wireless video doorbell or doorbell cameras because they don’t have a camera. If you don’t need to see who is at your door but only hear a voice- then a wireless doorbell with an intercom could be your perfect next step. But the truth is that they are not that many models to choose from. Whilst once they were cutting edge, now with the march of technology they have been overtaken. More people want a video doorbell instead of a doorbell with an intercom. And so, the pickings are pretty slim- which is why in my comparison I have lumped in a couple of camera doorbell models. If you haven’t been keeping up with the latest technology, chances are you still know bit about intercoms. Intercoms are communication systems that allow one person to talk to another person across, generally, a house. Possibly from the door to the living room. They mount onto a wall and with the press of the button, magically work. Intercom systems have existed for decades and have typically involved a set of wires connecting the different intercom units. But what you might not be familiar with is the new wireless technology. Thanks to advances in wifi and other tech, you no longer need to run wires across your house to communicate with someone on the other end. Everything runs through wifi internet or radio technology. Wireless intercoms are the future of intercoms. So why do you want a wireless doorbell intercom system? Why wouldn’t you! In this day and age an intercom is almost a must for all households. Our front doors are far from our living rooms, and we might miss packages. Or maybe we want to be able to speak to our guests before they come inside. It also provides security and peace of mind that you always speak to the person at your door before opening. If you live in a house and don’t have an intercom, you really should consider getting one. It not only benefits you, but your guests too can contact you easier from the front gate or front door. Doorbell intercoms are exactly what you want as a new edition to your home. Wireless intercoms allow two-way communication between guests and you. They do not require large amounts of set up, nor the placement of wires into your walls. This wireless feature means that they can be installed in less than an afternoon. Wireless intercoms also mean extended distance. You can place the transmitter and receiver across the house from each other and it still will work. The system is not limited by wires. Wireless intercoms can be hacked with more ease. Because all signal is transmitted through the air and your Wi-Fi router, someone who hacks the signal will be able to get information about your conversations. However, for most people this is not a threat. Every day Joe doesn’t have a team of hackers on his tail to worry about. When purchasing your wireless doorbell intercom, you are going to want to get the best possible product. The one that you really want. To get that, you are going to want to aim to get one that includes a few key features. These features will make sure you get what you want. First, you want to make sure it is completely wireless. No point having it wireless for communication only to find you need to plug it into a power point anyways. So batteries are generally the way to go. But beware! Check how long the batteries last in your intercom before needing to be recharged. Anything less than 3 months for the transmitter battery and 7 days for the receiver battery could be a red flag. You will also want to make sure that they either connect to Wi-Fi or can reach over 500 feet. Though most of us won’t need more than 500 feet distance between transmitter and receiver for our intercoms, this is a minimum to make sure that we have a strong signal. Of course, if it goes via your Wi-Fi router you just want to have a strong enough router to reach its signal across your house. Though it seems the world has moved on to more advanced tech, if you’re looking for a blast from the past the Aiphone issue to bring some nostalgia. Though it is a design decades old, it still is on the market today and being used by hundreds. Its simple design includes the ability to speak to anyone who rings your doorbell via the intercom system. This system has adjustable volume to meet your needs. And if you want, an add on can be installed to allow remote electronic door opening to the Aiphone system. But the Aiphone system has a number of shortcomings. It is not near as durable as other doorbell intercoms and needs maintenance to not wear out. Though it is water resistant, I don’t recommend putting it somewhere it could get wet. The Aiphone also needs a DC 6-volt transformer to operate. But C cell batteries can be installed also to allow for it to be placed far from a powerpoint. In my opinion this is a nice bonus, as in many houses power point can be few and far apart. The system is in the mid-range when it comes to price. For $110 USD you get the basic system. Though this system doesn’t come with a lot of perks and benefits, it’s simple and easy. You push the button, you talk. No hassle. Anyone who just wants their old school intercom system would be content with the Aiphone system. It’s simple and easy for those who hate the sight of technology, while still affording the luxury and security of an intercoms system. It doesn’t come with bright or complex buttons and knobs, perfect for those who are elderly. The Aiphone, though not top of the range by any means, gets the basic intercom job done. The AUNEX video doorbell and intercom system is a great product that allows not only two way voice communication, but also the ability to watch your doorstep from your cell phone. The systems app is easily downloadable onto any smart phone you want. From the app, you will get alerts overtime someone walks by your door. You will have peace of mind and the security of being able to watch at any time who is coming up to your door. But the AUNEX does even more. It not only allows you to watch who is at the door, you can record too. With the simple implant of an SD card. Your AUNEX system will record everything that happened for later viewing. The AUNEX has something else that other systems may lack. That is a lot more than other systems and allows you to see almost everything in front of the camera, a clear advantage for those who want it. Besides these major advantages of this system, it also comes with night vision and displays video in 720p HD. It’s easy to install and come with a 45-day money back guarantee. This is great for those of us who might be suspicious if this system works or not. This system is great for anyone who wants to be able to watch their doorstep from their cell phone. It provides peace of mind and the luxury of knowing when anyone is at the door. Not only is the Hosmart doorbell intercom wireless from transmitter to receiver, it requires no wires when it comes to power either. And with a single recharge lasting the transmitter over a year and the receiver seven days. Who wouldn’t want a system that can be eft to operate wirelessly for so long! The Hosmart is a great and adjustable system that works as an old school doorbell intercom, but with new tricks. Besides it wireless feature, it also produces great sound quality up to 1500 feet away. So if your door is 1500 feet away from where you want your receiver, your in luck with the Hosmart doorbell intercom system. My favourite feature though is the fact you can mix and match different combinations of Hosmart door bell receivers, transmitters, outdoor systems and indoor systems. And you can order them in different arrangements. This makes the Hosmart doorbell intercoms suitable for whatever your needs. 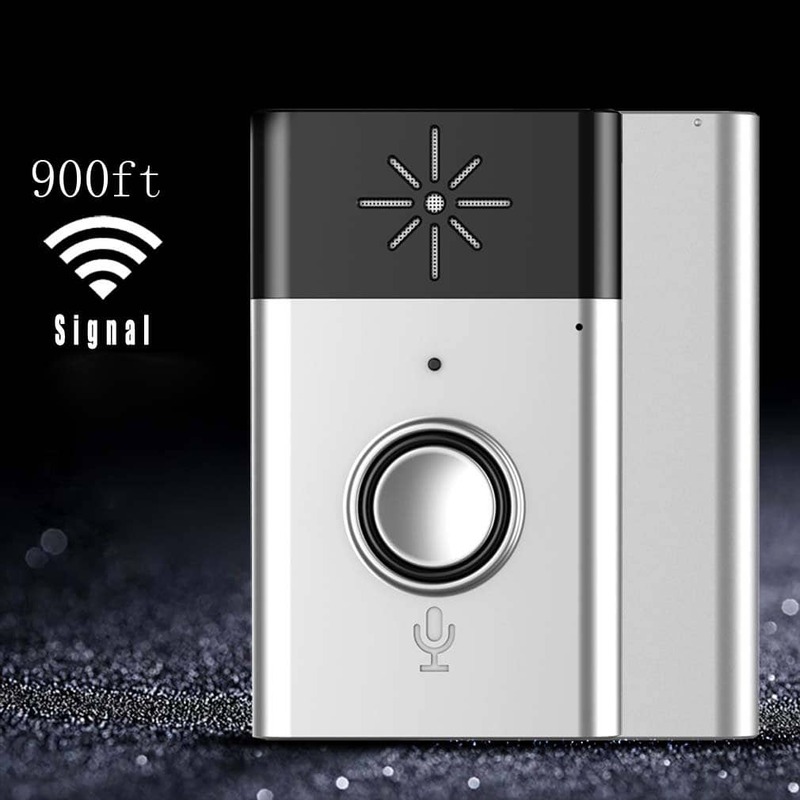 This intercom is a great choice for most people who want a doorbell intercom that allows full and crips audio between you and your guests. And it works at 1500 feet with no wires! Truly a great deal. If you’re looking for something cheap but still workable, then maybe the Napok is what you want. This system works completely wirelessly and can connect up to 600 feet between transmitter doorbell and receiver intercom. It runs on batteries and the receiver is rechargeable. However, the receiver needs to be charged daily and the transmitter every two months. The Napok system is small and can be placed just about anywhere you want it. And if its range, it can be almost anywhere in your house. However, where the Napok lacks is its durability. It is not completely waterproof, and it can succumb to the elements quickly. If you want something that can last near the sea or in the rain, this is not the system you want. Also, dropping or knocking this system, even with little force, will damaged it. So be careful with it! However, it makes up for this lack of durability in its price. It is in the lower price range as far as doorbell intercoms go. And even though its cheap, it still has clear signal and a decent range. The amount you need to charge it is reflective of the price. But having to charge the receiver and transmitter every now and then is only a minor inconvenience. The Napok is a decent system, but can also be hard to operate. It works as a radio would. You push the button to talk. It doesn’t automatically transmit your voice without pressing the button. But with a bit of getting used to this becomes a non-problem. I would recommend that if you want a cheap system for your home to be able to hear and talk to whoever is at the door, the Napok will work. It has everything an intercom system needs and works for all of us on a budget. The R RUISE wireless intercom may look like something a few decades too old, but it is by far one of the most durable wireless intercom systems on the market. And at a reasonable price too. The R RUISE system looks like an old-style home phone, coming with the ability to dial other intercoms. The intercom comes with a handheld receiver/transmitter that resembles a telephone. Through this you speak with anyone on the other intercoms. Besides the R RUISE intercom’s durability, it is simple to install. The intercoms connect to the wall easily and then are able to reach wirelessly over 800 meters. The signal also carries through walls and other obstacles to provide clear audio communication between the intercoms. You will always be able to hear without crackle what is being said, even across your house. The simplicity of the R RUISE system also allows it to be operated by everyone with ease. A push of a button, and you speak as if it’s a telephone. There are no fancy gadgets to work out, nor setting that need adjusting. The elderly or young children can operate it with no hassle. The system is wireless when it comes to power also, being battery powered and rechargeable. When the batteries run out a power cord is simply inserted to the intercom and connected to a home power point. The intercoms will then recharge for use again. The Lithium Polymer batteries, however, will last you ages. Though looking out dated, the R RUISE wireless intercom system is what you want if you are looking for simplicity and durability. Even if it isn’t the slickest or most fashionable system, they are great and easy to use. 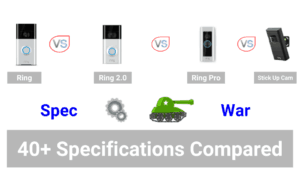 The Ring video doorbell system is not any ordinary view doorbell system. It is completely wireless, and allows you to view the camera footage from anywhere on your tablet or PC. Or even use your Alexa to voice command viewing of the doorbell’s camera! 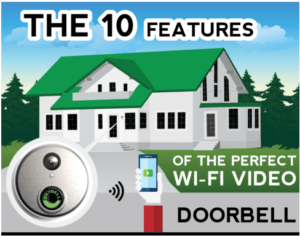 The ring video doorbell not only provides wonderful Wi-Fi on demand video, but also in full HD. You can view it on any device, and depending on the model you order you will get to watch in either 720p or 1080p. This will let you see every detail of your front door. What is more, the ring doorbell has full night vision. So you can view outside even when its night time or the weather is bad. And if you aren’t viewing the camera when someone comes, a message will be sent straight to your cell phone. This is done by motion sensor technology, which activates the camera and intercom whenever someone moves in front of the camera. The Ring video doorbell really is top of the range when it comes to its technology. And for a reasonable price! In fact, you can choose how much to pay by selecting one of the 4 different models with different features. If you are worried this technology will be stolen from your front porch, don’t fear. Ring has a full theft protection policy to replace your device if stolen, and replacement is completely free. Truly, this product fits the needs and wants of everyone. 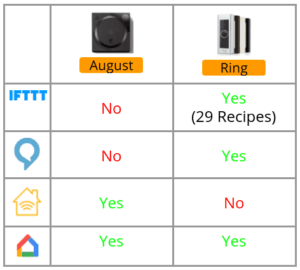 If you want a doorbell that connects via Wi-Fi, the Ring is a great choice for you.